, to enjoy the shows we love, and to ask and answer questions on maths, science, space and beyond. With a world of video in our pockets, there’s a world of possibility and knowledge at our fingertips. 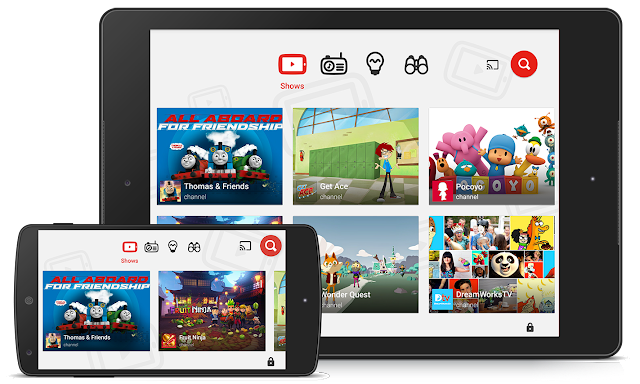 Today, we’re introducing the YouTube Kids app to Australia - an app built with parents and children in mind, that makes it safer and easier for kids to find videos on topics they want to explore. Since its release in the United States in February, the YouTube Kids app has been downloaded more than 10 million times, by families who rate it among the top kids apps available. Now, Aussie families will have a new way to discover and explore videos on every topic in, well, the universe. YouTube Kids is our first step in reimagining YouTube for families, built from the ground up with little ones in mind. Our family-friendly app makes it easier for parents and kids to enjoy the family content they love, and it’s now available to download for free on Google Play and the App Store. We’ve designed the app to be easier for kids to use, with a brighter and bigger interface that’s perfect for little thumbs to navigate. And we’ve built in voice search so that even if your child can’t spell or type, they can still find videos of things they’re curious about. Your family can even enjoy their favourite videos on the big screen, using Chromecast, Apple TV, game consoles or a smart TV. With larger images and bold icons, it’s fast and simple. And we’ve built in voice search so that even if your child can’t spell or type, they can still find videos of things they’re curious about. We’ve built the YouTube Kids app to be a safer version of YouTube, a family-friendly place for kids to explore their imagination and curiosity. You can browse channels and playlists in four categories: Shows, Music, Learning, and Explore, or search for videos of particular interest to your family. Your favourite Aussie shows from ABC Kids — Play School, Jemima's Big Adventure, and Giggle and Hoot — are in YouTube Kids alongside Thomas & Friends, HooplaKidz, and National Geographic Kids. You’ll also find popular content from Australian creators such as Charli's Crafty Kitchen, Bounce Patrol, and Hi-5 TV. Learn how the app works: When parents open YouTube Kids, we explain upfront how our systems choose and recommend content and how to flag videos. We always try to make the videos available in the app family-friendly but no system is perfect, so if you ever find a video you’re concerned about, please flag it. This helps make YouTube Kids better for everyone. Custom passcode: Parents have the ability to set their own passcode. YouTube Kids is available for free starting today in Australia on Google Play and the App Store. We’re so excited to help kids and families discover, learn and create in new ways. From our family to yours, happy exploring! Posted by Malik Ducard, Dad of three, and Global Head of Family and Learning, YouTube, who recently watched an episode of Wonder Quest with his family. For years, my family and I have watched countless hours of videos on all kinds of topics. We use video to learn and listen to nursery rhymes, to enjoy the shows we love, and to ask and answer questions on maths, science, space and beyond. With a world of video in our pockets, there’s a world of possibility and knowledge at our fingertips.